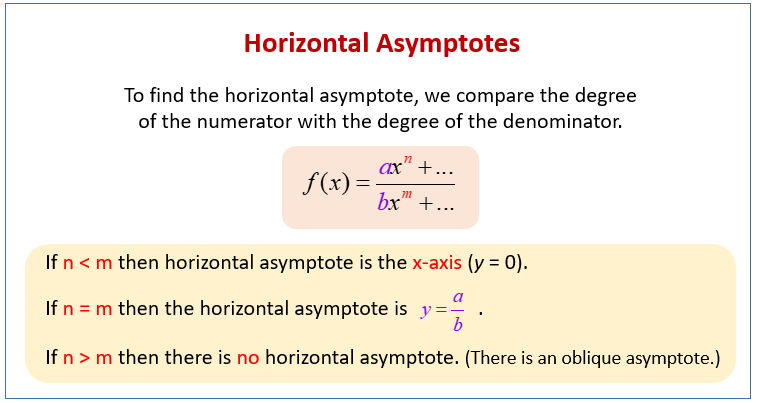 Examples, videos, worksheets, solutions, and activities to help PreCalculus students learn about horizontal asymptotes of rational functions. The following diagrams show how to find the horizontal asymptotes of rational functions. Scroll down the page for more examples and solutions on how to find horizontal asymptotes. There are different characteristics to look for when graphing rational functions. When graphing rational functions where the degree of the numerator function is less than the degree of denominator function, we know that y = 0 is a horizontal asymptote. When the degree of the numerator is equal to or greater than that of the denominator, there are other techniques for graphing rational functions. There are different characteristics to look for when creating rational function graphs. With rational function graphs where the degree of the numerator function is equal to the degree of denominator function, we can find a horizontal asymptote. When the degree of the numerator is less than or greater than that of the denominator, there are other techniques for drawing rational function graphs. How to recognize when a rational function has a horizontal asymptote, and how to find its equation. There are different characteristics to look for when creating rational function graphs. With rational function graphs where the degree of the numerator function is greater than the degree of denominator function, there is no horizontal asymptote, but there may be an oblique asymptote.